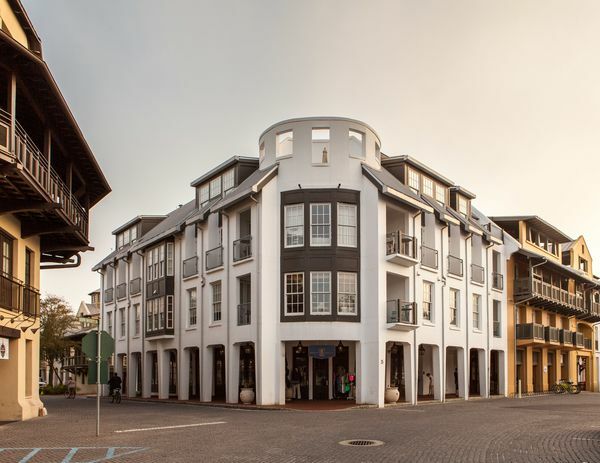 Located on the South side of Hwy 30-A at the southern tip of Town Center, The Savannah Loft in downtown Rosemary Beach is one of the newest properties in the community. With gulf views, elegance, and style, this property provides an inviting and extremenly convenient setting. The Savannah Loft has 2 bedrooms (king & queen beds) and 2 1/2 baths - each guest has plenty of privacy and comfort. Built and furnished with a juxtaposition of natural materials, the Savannah building utilizes masonry construction with accents of slate, granite, brick, and stainless steel. The interior furnishings carry out this theme with the use of copper, silver, leather, suede, silk, and cotton. Blending a few old style pieces with modern furniture and conveniences results in a delightful ambience. The large main living/dining area has a fully equipped chef's kitchen, dining for 6-8, and a flat panel tv in the living room. Looking out to the outdoor dining/patio with room for private sunning, you'll enjoy gulf views through 4 sets of French doors. The beach, just a one minute walk from the building does not require crossing public roads. With 4 community pools to choose from (and a 5th one on the way) there are a multitude of swimming options. A fitness center and tennis courts are available for those of you desiring a more rigorous vacation. Call today to book your memorable vacation in the Savannah Loft. If you've enjoyed our other property, the Barrett Loft, you'll love this one! Viking appliances including a gas range, All Clad cookware, and Riedel wine glasses outfit this Chef's kitchen! An assortment of CD's are included. (2) Both bedrooms have a small balcony - perfect for enjoying that morning cup of coffee or evening glass of wine! A 20x20 patio has views of the Gulf, a dining table for 6 and lounge chairs for sunning! We have rented here a couple of time and hope to again in the future!! Great location. Great space. Love the back stairs so kids can come and go freely. This is a great location in Rosemary. The condo is beautifully furnished. I plan on staying here again. Great location and perfect amount of room! This was our 10th year to go to RB, and we had a great stay. The loft was perfect for us, and the location was great. The only thing that I could see as a negative to anyone is the noise level outside. It didn't really bother us, and in fact, it was somewhat entertaining. However, someone with very young children may find it bothersome. There was noise late into the night- laughter, kids having fun, etc..., and also early morning noises- trucks, trash being picked up, etc.... My kids are middle school and high school age, and it didn't bother them at all. Thanks for sharing your loft with us! We will definitely be back! I am so glad that the Savannah loft was a great fit for your family. We look forward to having y'all back! Overall, this is a nice 2-bedroom condo. The master bedroom is huge, with a nice bathroom and an extra sunny little nook for reading and hanging out. The secondary bedroom is smaller with a queen bed, but still decent. We picked this condo thinking it would be great to be "in-town." However, it was pretty loud. In the evening, we could hear people talking outside till at least 10pm. May not be a big deal for adults, but we were with smaller children who go to bed early so that was annoying. In the morning, starting 6am, delivery trucks are bringing food/supplies to the restaurants, so that is very loud. Plus trash truck was picking up trash at 5am on one of the days. Again, for people who normally live in big cities and are used to city noises, this may be fine. But if you live in the suburbs and prefer quiet, this is not the place for you. Same if you have small kids who go to bed early - not the best spot. I am glad that you enjoyed the size of the Savannah loft. The Master does have a lot of light and windows so that is great that you could take advantage of the nook area. That surprises me that you could hear people being so loud outside as RMB is very strict about the noise policy. Yes the Savannah loft is on Main Street and is in the middle of things, and during the Summer since Rosemary has grown in popularity the deliveries and trash pick up is probably scheduled early so as not to be in the way when everyone is out and about. I will put in a request to the RMB POA to remind these deliveries and trash pick up that we do have guest in that building and to be considerate. We loved staying here. Super close to the beach, just above the main town square. Family loved it! I am so glad that y'all enjoyed your stay with us in the Savannah loft. Easy access into building (no fussing with keys or cards), great location to beach and many, many restaurants and shopping, clean and comfortable although the location is not super quiet (construction, garbage pick ups, etc) and since it is in town, the location does not get very dark for sleeping in. This is a location for families or couples coming to relax, not a lot of night life of bars and things shut down early - which is exactly what we wanted. If you go and want beach chairs and umbrella, book early as they fill up. We had "third row" beach chairs but they were still fine (this is an additional expense). I did appreciate how responsive the owner was after booking with my random questions. If you like to bike, this is perfect area. We had a great and memorable vacation and will definitely go back to this area when our budget allows. We are so glad that you enjoyed the Savannah loft. We love that we have been able to eliminate keys. With the way Rosemary is growing there do seem to be a few more construction trucks. We hope you will come back and stay with us for your next visit.